It's a handy metaphor for thinking about how politics is often reported in Australia. The 24 hour news cycle, the constant polling, the appetite for scandal and intrigue, the imperative to report the day-to-day minutiae, the isolation of Canberra and the close bonds between journalists, political staffers and MPs mean journalists and commentators often lack the perspective to place events within a broader context. Politics, in this sense, is just shortsighted managerialism; the goal is victory at the next election. There can be no vision for building a better society. It's all risk-management. Everything's fine until it's all coming down. Recent election reporting in America was unquestionably plagued by many of these same problems. 'Experts' were almost universal in their pronouncement that Trump couldn't win. Then, once elected, many of these same pundits — still dumbfounded as to how they could have got it so wrong — turned to warning the public not to normalise him or his behaviour. Lagging fashionably behind as is our wont, this week it was the Australian commentariat's turn to warn against a process that has already occurred. Writing for The Conversation, Michelle Grattan intoned, 'One Nation has now been "normalised" in the Liberals' firmament of political players'. But this is not the beginning of the normalisation of Hanson and One Nation — it's the end, and Sinodinos, as John Howard's former chief-of-staff, has played a not insignificant role in it. In a piece for The Monthly, Dominic Kelly highlighted how large swaths of the rightwing commentariat have embraced the 'more mature', 'disciplined' and 'principled' Hanson 2.0. "The mistake pundits make when asking whether One Nation has been 'normalised' is to see them as an aberration — as a breaking with the political order. But One Nation is an extension of it." Despite this rhetoric, for the Right, appeasing One Nation has always been a balancing act. They're guided by one question: How much racism is permissible before it has to be condemned? As a settler colony, racism is intrinsic to Australia's history. It's manifested itself in many forms and its victims have been numerous and varied, but it's been ever-present. Hanson has built her career on this: she rose to prominence attacking Aboriginals, then Asians and, now, Muslims. Her racism is born out of a kind of nationalism — it's undoubtedly genuine, but it's always opportunistic, as is evidenced by her willingness to change her targets based on the national mood. More significantly, it's an imperative. Without it, Hansonism couldn't exist. She is not, despite what Sinodinos claims, having more success now because her party is more 'sophisticated'. She is, rather, capitalising on a broader and increasingly prevalent sense of alienation and disillusionment within the culture. She has an intuitive sense of this, but she doesn't seem to understand it in any meaningful way. Her praise for Putin, for example, was more about toeing a Trumpian line — an effort to be his Australian equivalent — than any actual thought-out political position. This fragmentation poses a threat to stability and undermines the government's ability to rule. In their quest to foster a sense of national unity, they often exercise one of the few powers they have left — control over their borders. Career politicians don't, of course, articulate these sentiments quite as crudely as the likes of Hanson, but they convey them in other ways. By locking refugees up in what are essentially prisons, for example; or sending the navy to deal with them, despite the fact that they — in over-crowded, leaky boats — pose no military threat; or by claiming that they're violent or that they throw their children overboard and are, therefore, unfit to be granted citizenship. People pick up on these cues, as indeed politicians intend them to. But Hanson comes right out as says the things that politicians have long implied — the things that they long considered un-sayable. For this, she's held up by some parts of the electorate as a truth-teller; unbridled by 'political correctness' and willing say what everyone's apparently thinking. And well may they be thinking these things, but that is in no small part because that's the agenda both major parties have been pushing for over a decade now. The mistake pundits make when asking whether One Nation has been 'normalised' is to see them as an aberration — as a breaking with the political order. But One Nation is an extension of it — the inevitable by-product of decades of racialised, anti-immigrant politics. Desperate asylum seekers, who are not illegal and have every right to seek asylum, are suffering in off-shore 'hell holes' in our name, and that's not fine. The standard we pass by is the standard we accept. Contact key parliamentarians on both sides of the house and ask them to 'BRING THEM HOME' TO AUSTRALIA! Grant Allen, I agree. Bring them here. For their sakes and for ours. I grew up in the "cold war" years when it was "reds under the beds" and the threat of the "Red Peril" from China. The Nuns in particular made a great issue of this threat and how we may have to "die for the faith". At least then we did not have the 24 hour news cycle to contend with-indeed in primary boarding school we had no access to the media at all except when on holidays. In secondary school, our Dorm Master put the front page of the SMH and the sports page on the notice board . We had a radio in the Dorm which he switched on in the morning and before "lights out" so we knew what was happening during the Cuban Crisis and that morning (our time) when Kennedy was assassinated.. However the world was a predictable place and we accepted the status quo. Today people are bombarded with horror stories hourly. As Tim concludes; "Everything is NOT fine" - you bet it isn't ! Is it any wonder insecurity breeds such groups as "One Nation"? Tim Robertson is right. I see no sign whatever of Pauline Hanson and her party becoming more sophisticated - in fact the opposite is true. The Coalition needs to say this kind of thing in order to justify its embrace of Hansonism, at least at some level. 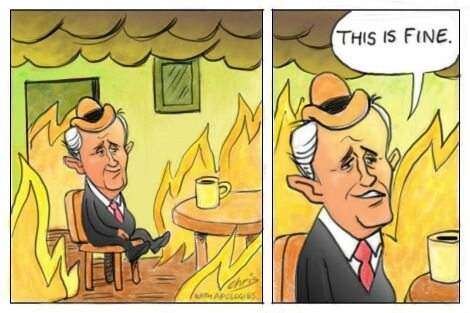 Where is the former Malcolm Turnbull when he is desperately needed by his party, and the country? One of the most reasoned and accurate assessments of current world wide political woes to have appeared in the written media for some time. This malaise is not peculiar to Australia but is indeed well ingrained in Western society and testimony to its accelerating decline. Racism is a characteristic of the human being, a herding animal who sees his own herd or tribe as the best among all others and is prepared to protect that at all costs against all comers. In saying that ,however, Australia's particular brand of racism does not hold a candlestick to that of some other tribes and certainly does not reach the extremes seen in some other countries. We do, however, like the USA and Western Europe, have our pockets of extremism which appeal more generally when we see our particular cultural tribe being threatened by other cultural tribes. As you suggest, Tim, the lack of vision and intellectual capacity of large sections of the media driven by fleeting journalistic fame unnecessarily fuels and shapes societal attitudes. Western society is buggered and when it is supplanted by other emerging tribes, then we will see a different brand of racism which might well exceed anything that distresses us so much in our socially just, declining age. Hopefully most of us will be sitting on a cloud listening to angelic choirs when that time comes! Tragically, an excellent review of the status quo, telling it as it is. Good analysis I think. But to allow boat people access and residency on Aus. soil presents political capitulation to erstwhile adopted defaults. Perhaps Grattan's suggested tweak of a temporary amnesty for those on Nauru and Manus that becomes effective for them at the end of a rational impartially determined queue could be a solution. That would also bring NZ into the picture as a temporary embarkation point. NZ won't play ball if any of their citizens might be refused equal access to Aus. down the line. We the people decide through our vote how we want the society we live in to be shaped. At the center of the political spectrum is a debate about extending tolerance to ethnicities and religious groups whom many believe are themselves intolerant. The political right have made up their mind on this issue. The left have made up theirs and the decision will rest with those who populate the middle. This middle group is not saturated with the "deplorables" as Hillary so regrettably stated but lots of educated people that don't think the system is working. Remember Wisconsin voted Bernie above Hillary in the democratic primary and then jumped to Trump for the election. Voters are tired of the political establishment and want real change. They are tired of being told how they should think. Its a global movement, not just an Australian one. my Italian born mother taught me "Il lupo cambia il pelo ma non I vizi" ie, the wolf can change his fur, but not his habits. Refering to Pauline and her party which the Liberal premier in WA declared he didn't even know what her party platform was. Such a logical and decent appraisal, which I fear will go unheard amongst all the right-wing noise that masquerades as the "journalism" of today.